Yikes! When I heard last week someone say it was October, my heart missed a beat! Is the year escaping me? I’m convinced the world is spinning faster as days fly, weeks skip and months on occasions simply disappear! Four years ago I felt the need for a way to summarise my year. A single sheet that would encapsulate what I’d been up to over the course of 12 months so at year’s end I could see what I’d experienced – I could view my year at a glance. I pulled out a Journal Map. 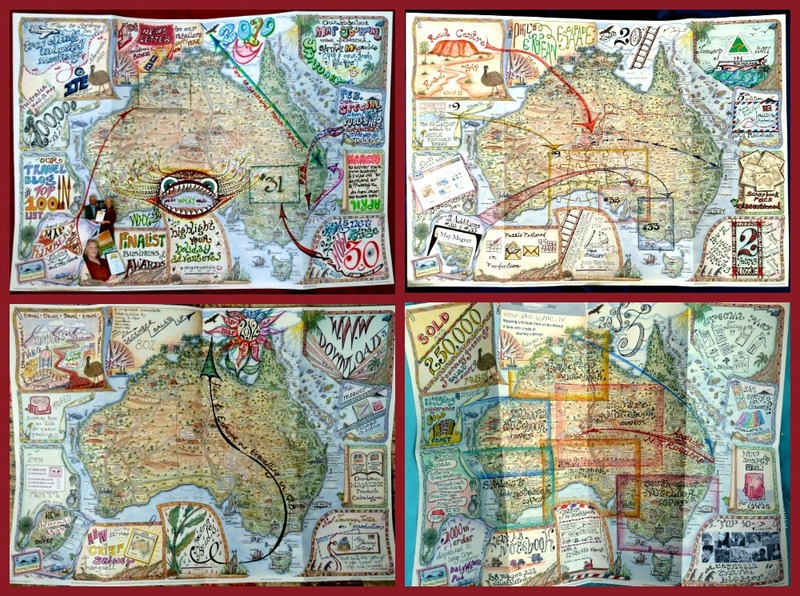 Seeing the central map on these A2 sized sheets as a representation of journeys both in general – and more specifically as a portrayal of Life’s Journeys. As you can see – They’re no works of art! They’re merely a pragmatic way to summarize my year on a single sheet! Using each of the 11 surrounding boxes I record a highlight at the end of each month. A scribbley, messy, reminder of what the main thing was that happened in the preceding 4 weeks. 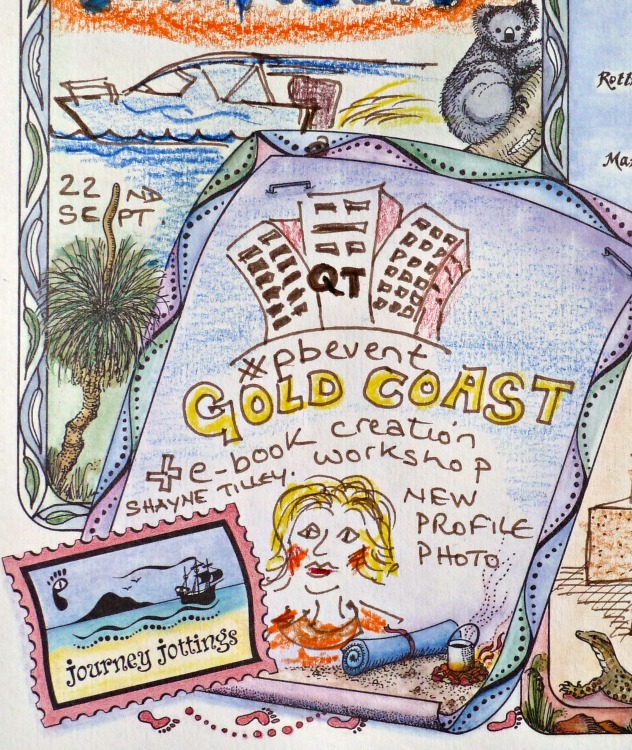 Heading off to the Gold Coast for the ProBlogger Conference where the lovely Rachel Devine offered new profile photos to 50 attendees. I have to say – My Year at a Glance is a lifesaver! As I roll my eyes saying – where did that time go? I can reflect and recall moments that deserve to be memorable. So what has happened to 2014? Above is my year at a glance so far! No flicking through pages and pages of diaries, or checking out some (soon to be superseded) on-line app. And in the coming month… I’m flying to Greece for the travel blogging conference TBEX. Where have you been and what have you done? And how do you recall your highlights? Have you considered creating a Year at a Glance? You have such an artistic talent and I do love how – with just one glance you can remember what you’ve done. Pictures are much better reminders than words. I agree that time is spinning quickly. Hope it feels like that come winter. 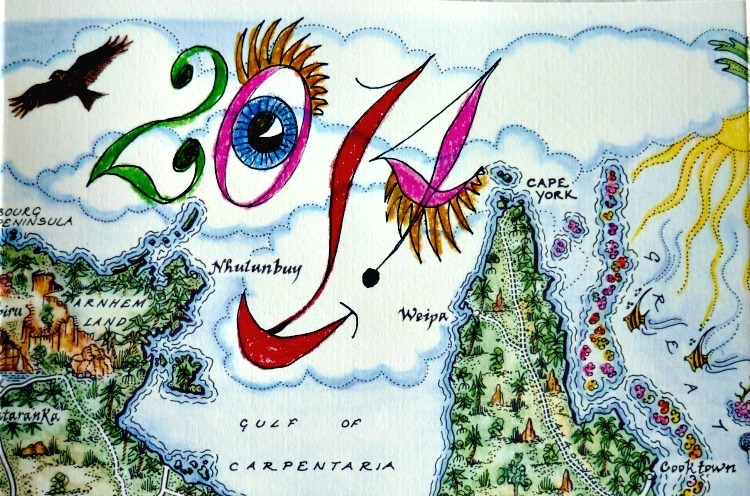 Your maps are so creative and I love the “year at a glance” idea. As for time, my theory about the days, weeks and months whizzing by at lightning speed is that we’re having fun doing what we want to do, when we want to do it. No more clock watching! And for me, it doesn’t help living in a sub tropical climate, where there aren’t the demarcations of seasons to remind you another 3 months has passed! For us our own blog, accompanied by an old-fashioned paper diary where we jot down the names of places we passed and a few cues, is our way to store travel memories. The most important thing is to name photos early, best within a couple of days, or we forget small details. I think those who aren’t using a so called “old-fashioned” paper diary in years to come will possibly live to regret it when platforms get superseded (like video players have) and their material is no longer accessible! Time is indeed spinning quickly, and I love how you capture your years. I’ll never give up my old fashioned paper journals — well, until some unfortunate relative has the task of ‘cleaning out’ my stuff one day — You always have such wonderful, creative ideas and I think one day ‘maybe’ I’ll give it a try. Time is just going too fast as you noted to get everything done! I love these and have to disagree with your comment that they are no works of art. They ARE. I could get lost in each one. What a fun and uniquely “you” way to journal. I use whatever is the quickest and simplest way to convey where I’ve been and what I’ve done that doesn’t involve a wall of words! 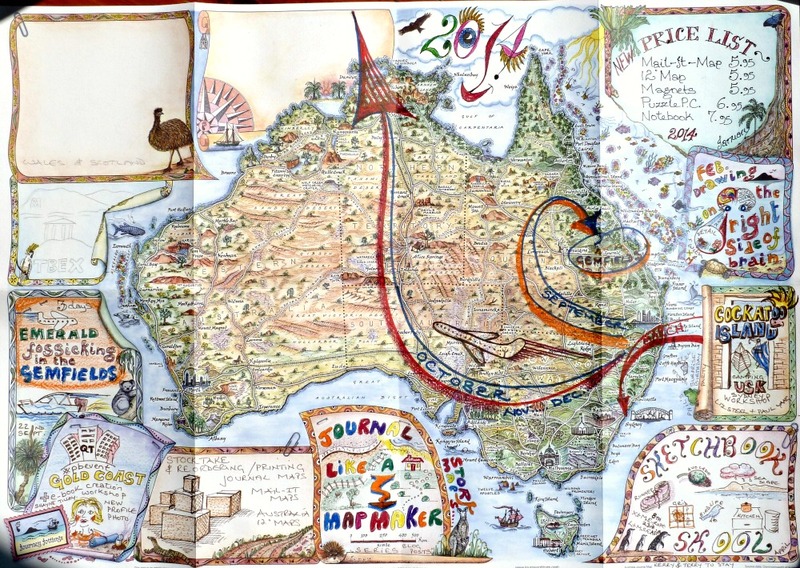 Love your journal maps and I wish there were one with a globe map. They are works of art as you’ve created yours and such a treasure in this digital age. I can only imagine framing them as a group over the years. Nice work! Thank you Elaine ~ You’re right – One with a globe would be fun! 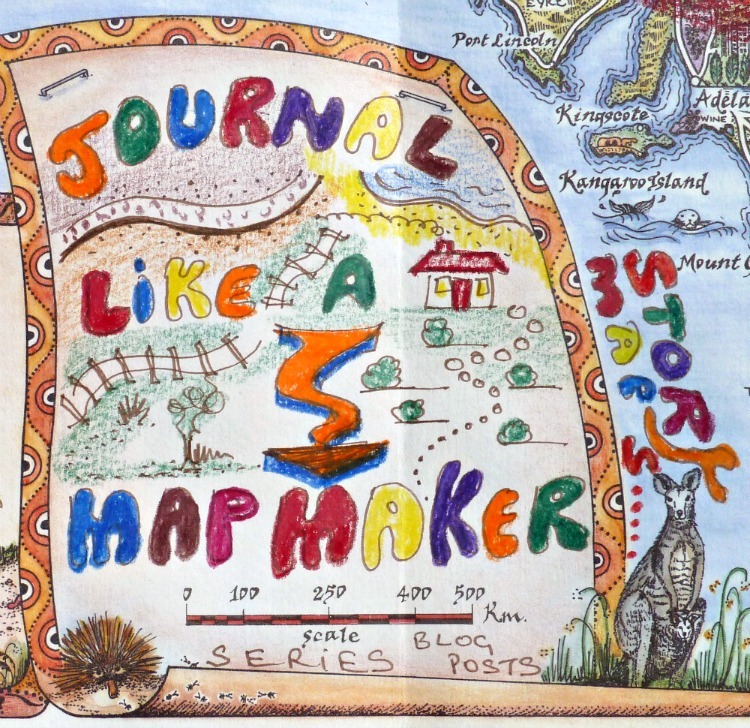 Your journal maps are gorgeous. I need to get better about organizing photos and travel mementos. It’s too hard to remember exactly where I was or what the story behind the picture was! Yes – the way the year flashes by it’s great to be able to literally see at a glance where it’s gone and what I’ve done. I love the way you memorialize your year! Not being an artist, I summarize mine in my Christmas letter every year (it’s very short and sweet): number of countries, states and continents, and a few photos. This year, so far, I have visited 11 countries, 21 states and four continents. And, I scrapbook! 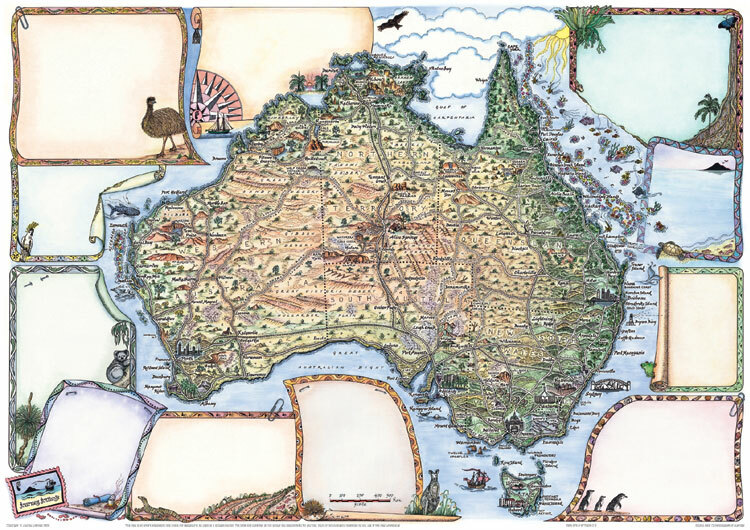 How exciting you’ve been inspired to create story maps – And had fun in the process! For the year it is simply a case of stopping at the end of each month and saying – What have I done? You are an artist, whether you consider yourself one or not. These are interesting and beautiful and fit with your talents and abilities, I’m sure. My “year at a glance” would most likely be a photo diary of sorts. You’ve given me an idea, as I often have to look back to see when I visited a particular island. The years are starting to run together! Thanks for preparing this thought-provoking post! I think it was that very feeling of years starting to merge together that made me think I needed something where I could see events in their place! I truly love the idea of summarizing this year with a story map. It’s been a busy year and there is no way I will remember everything I did in 2014 in a few years or even next year. Your story maps are beautiful! I certainly find being able to see my year at a glance an absolute boon! When I saw the title of your post speaking about the end of the year, like you, I gasped! Time really does fly. Your museum-quality drawings are such a beautiful way to capture memories. And with a trip to Europe about to happen for me it really will be christmas before I know it! I also can’t believe how fast the year has gone. 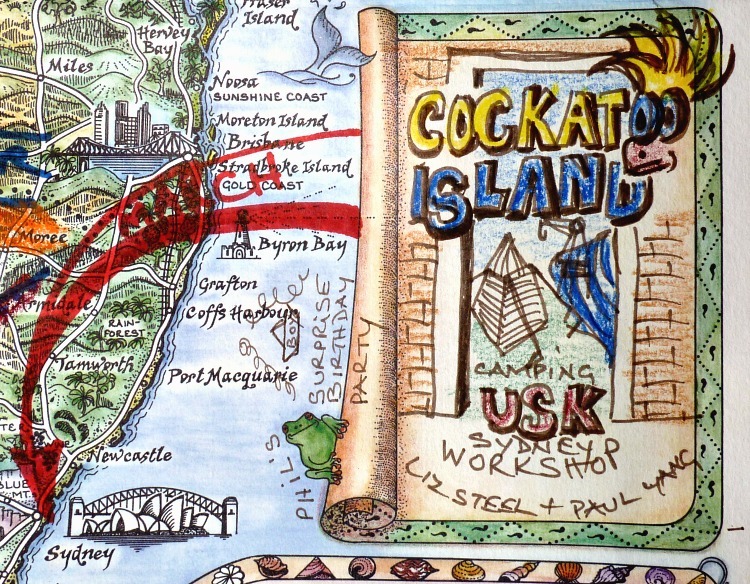 Yes, of course I LOVE your maps and artwork and just go ‘Ahhh’ each time I see another (Btw, I love your lead photo to this post), but I know I couldn’t do the same. But we do use Photo Books to record our trips and travels, so they don’t totally get forgotten. But oh to be able to draw and have your talent – sigh! It’s like your writing Jo, it simply takes doing it repeatedly, so slowly but surely (read dogged determinaion!) something other than a kindergarten rendition appears! Haha a very different cartoonish site you have, really like the concept, hats off! As you know, I’m a HUGE fan of your work! 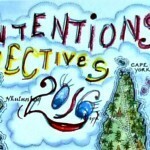 I love, love, love this year at a glance project. And I look forward to hearing about your travels to Greece, which is high on my list of places in the world I’d love to visit. We spent a week on the island of Tinos, and a week after the travel blogging conference going up to magnificent Meteora where monasteries were built atop tall narrow mountains! And then down to Delphi which was wonderful! I’ve just discovered your site, I think via twitter? Anyway, love it. And I agree with everyone else, works of art! I know it is a bit late but I think I will do a year in a glance now. You have inspired me. 2014 was great, why not! As time goes by, you’ll be more and more pleased you took the plunge when you did!